Eastleigh Museum is celebrating its 30th Birthday this month – happy birthday! The birthday was celebrated with tea and cake by volunteers, staff and representatives of the organisations responsible for the running of the museum. Our museum first opened its doors on 3 October 1986 in what was originally the Salvation Army Citadel. 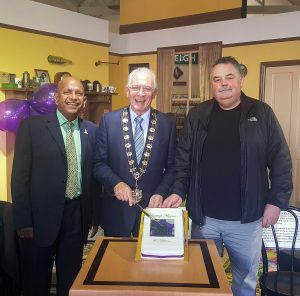 The Mayor and Mayoress of Eastleigh attended, and the Mayor, Cllr Des Scott, opened the proceedings with a few words and cut the birthday cake. Tim Kelly of Hampshire Cultural Trust also spoke, commending the Trust’s happy partnership with us here at One Community, and with our volunteers who are responsible for the museum’s front of house services. He noted the warmth of the welcome they extend to all the museum’s visitors. Chair of One Community, Sri Kandiah, responded in kind. One Community, with our team of dedicated volunteers, is responsible for the day-to-day running of Eastleigh Museum, in an innovative partnership with Hampshire Cultural Trust, Eastleigh Borough Council and Hampshire County Council, to preserve and record Eastleigh’s heritage and provide a community hub. The temporary exhibition currently showing in the Museum’s gallery celebrates the 60th anniversary of local firm Peter Green, including pictures from the past and memorabilia highlighting the connection to many well-known local events and activities.